A Talon rear sprocket for the Gas Gas Pampera. Available with 38 or 42 teeth, in a gold finish. The rear sprocket for the Pampera looks very similar to the standard Gas Gas sprockets, however they are drilled quite differently. Pampera chains take a hammering, and it is good idea to fit an O-ring chain for extra life, compared with the standard trials chain. However with the standard 12T front sprocket, sooner or later the larger O-ring chain eats through the clutch slave cylinder. It is neccesary to fit an 11T front sprocket but this then changes the gearing, and a 38T rear sprocket is required to return to stock ratio. 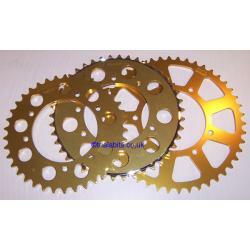 So if you want standard gearing, please choose the 42 tooth sprocket, and a Gas Gas (not Pro) front sprocket with 12 teeth. You will then need a 520 standard type chain with at least 104 links. If you want to do the o-ring conversion, please choose the 38 tooth sprocket and an 11 tooth Gas Gas (not Pro) front sprocket. You will then need to choose your 520 o-ring chain.